Linz, Austria, is a city on the Danube. The extent of the Anabaptist movement in Upper Austria in the late 1520s can be learned from the records of the cross-examinations given the imprisoned Anabaptists in 1527-1528 in several cities in Germany, and also from the reports sent to the government by various authorities. We learn that after the dispersal of the congregation founded at Steyr by Hans Hut, Linz became a center for the Upper Austrian Anabaptists "ob der Ens." According to the court records of Passau, Kasper Weinberger, a linen weaver, had moved to Linz from Freistadt, where he was baptized by Jakob Portner, the chaplain of the baron von Roggendorf, and with him a cobbler named Wolfgang and his sister. Hans Stieglitz and his brother Leonhard were baptized in an inn at Linz at Michaelmas in 1527. Ambrosius Spittelmaier, a relative of Hans Spittelmaier of Nikolsburg in Moravia, made some significant statements. Ambrosius "stemmed from Linz where his father lived." "His name which he received in baptism as an infant he was keeping, but not the baptism." Expelled from Linz, he had gone to Augsburg. Then he was arrested in Kadolzburg and tried in Erlangen. His principal teacher he said was Hut. In addition there was also the German secretary Leonhard Freisleben, also known as the schoolmaster of Wels, and his brother Christoph, and also Hans Kirchner of Wels. The Anabaptist group at Linz included also Jakob of Meissen, who was serving as an "apostle" near Freistadt, and especially Wolfgang Brandhuber, "the preacher of Linz," and Hans Schlaffer also "sometimes called the parson of Linz," Hans Fischer former secretary of the baron of Stahremberg, also Thomas of Grein, usually called Waldhauser, who was burned at the stake at Brno two days before Easter 1538. The Linz Anabaptists also include Johannes Bünderlin, of whom the Vergichtbuch of Strasbourg makes the comment for the year 1529: "was baptized in Augsburg, spiritually akin to Denck". Little is known about his life. It is not even known whether he died a natural death or was burned as a sacrifice to his convictions. Brandhuber was condemned to death in 1529 "as a preacher and a ringleader of the seducing sect," together with the preacher Hans Niedermaier and 70 others. According to the account in the chronicles of the Hutterian Brethren, Brandhuber faithfully taught Christian brotherhood above all, one of the main principles of this group of Anabaptists, "that one should have all things in common which serve to the glory of God." But the stern orders of Ferdinand I against the Anabaptists had not accomplished what he expected of them. On 11 May 1532 he wrote to the magistrate of Upper Austria: "in spite of serious mandates the sect keeps on increasing in our principality under your jurisdiction. The best way to conclude the affair with the Anabaptists imprisoned in Linz, Wels, Garsten, and other places would be by instruction. For that purpose four honorable, clever men, two clergymen, and two secular, should be commissioned to indoctrinate them. Those who are penitent shall receive mercy; ringleaders, preachers, and backsliders shall be treated according to the regulations which have been issued." In consequence of this decree several of the Anabaptists in Linz offered to abstain from their doctrine. The government then passed suitable measures. After that time there was a rapid decline of the Anabaptist movement in Upper Austria. Hege, Christian and Christian Neff. Mennonitisches Lexikon, 4 vols. Frankfurt & Weierhof: Hege; Karlsruhe: Schneider, 1913-1967: v. II, 659 f.
Jakel, Josef. "Kirchliche und religiöse Zustände in Freistadt während des Retormationszeitalters." Jahresbericht des Staatsgymnasiums in Freistadt 19-20 (1889-1890). Jakel, Josef. "Zur Frage über die Entstehung der Täufergemeinden in Oberosterreich," Jahresbericht des Staatsgymnasiums in Freistadt 25 (1895). Jakel, Josef. "Zur Geschichte der Wiedertäufer in Oberösterreich und speziell in Freistadt." Bericht über das Museum Francisco Carolinum 47 (Linz, 1889). Jörg, J. E. Deutschland in der Revolutionsperiode. Freiburg, 1851. Nicoladoni, A. Johannes Bünderlin von Linz und die oberösterreichischen Täufergemeinden in den Jahren 1525-1531. Berlin, 1890. Nicoladoni, A. "Johannes Bünderlin von Linz und seine Stellung zu den Wiedertäufern." Bericht des Museums Francisco Carolinum 46 (1888). Loserth, Johann. "Linz (Oberösterreich, Austria)." Global Anabaptist Mennonite Encyclopedia Online. 1957. Web. 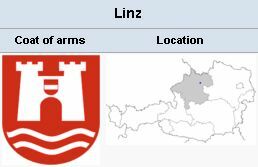 23 Apr 2019. http://gameo.org/index.php?title=Linz_(Ober%C3%B6sterreich,_Austria)&oldid=145724. Loserth, Johann. (1957). Linz (Oberösterreich, Austria). Global Anabaptist Mennonite Encyclopedia Online. Retrieved 23 April 2019, from http://gameo.org/index.php?title=Linz_(Ober%C3%B6sterreich,_Austria)&oldid=145724.